Orchestral Tools is a brilliant symphonic software company that creates robust toolsets for professional film and video game composers. 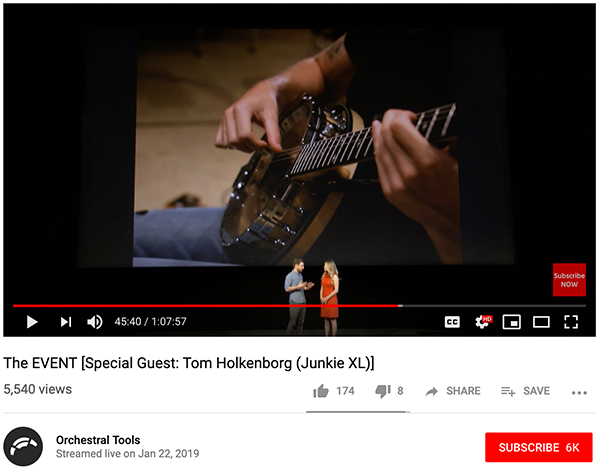 For their product launch during NAMM this year, they wanted to stream their event in the style of an Apple Keynote and they chose Varvid to handle the video production and streaming. Keynote style product release live stream at the Paramount Theatre in Hollywood, California delivered via Youtube and Facebook. 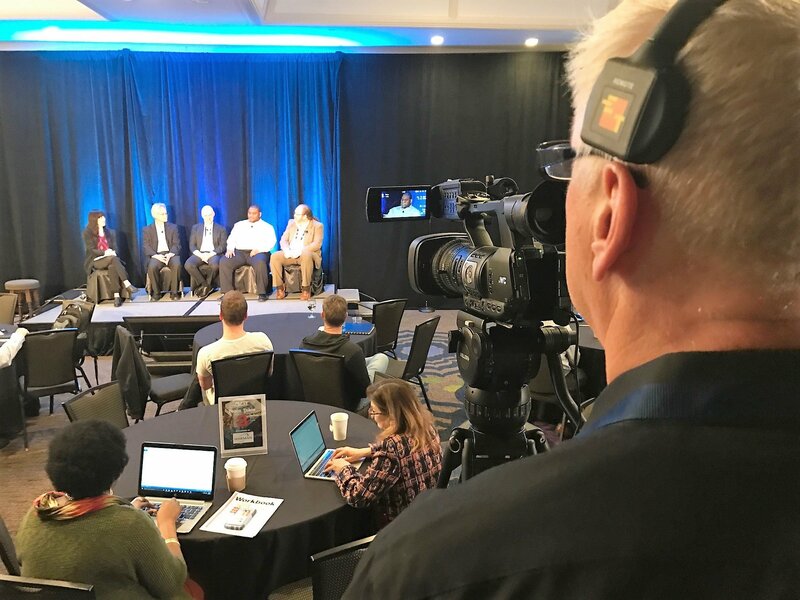 We delivered a three camera live stream with a mini jib for this well-produced show that streamed on their Youtube channel and their Facebook page, which used to also crosspost to one of the presenter’s Facebook page as well. This was the company’s first live stream and the online views and interactions tell us, it’s just what their audience was hungry for. The Facebook Live stream, the first for this company received over 2,000 engagements! Frontgate is a leading home luxury multichannel retailer who does recurring live streamed events with us from their storefront locations. Because Facebook is really prioritizing live content, we find that for many of our clients, it is a great fit for getting the most viewers on your streamed event. 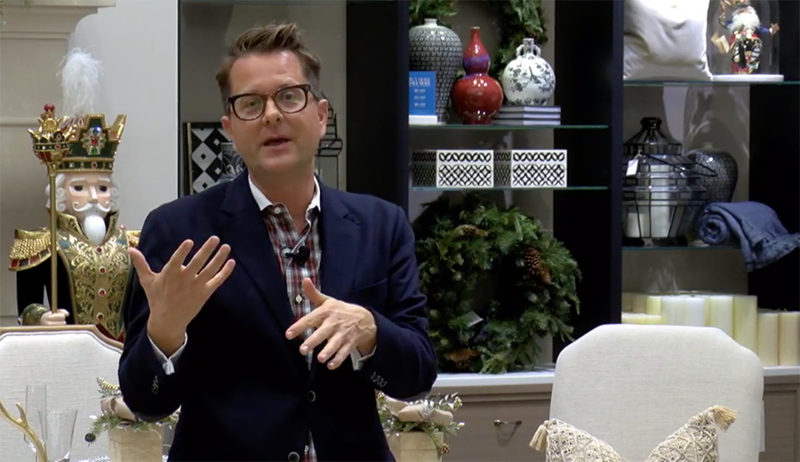 Frontgate’s last event was streamed from their Dallas/Plano, Texas location and featured a prominent designer, author and gourmet guru, Nathan Turner, who shared recipes and favorite products for holiday gatherings to a small local audience and reached thousands more via their Facebook Live stream. We love the big brand’s use of live streaming to bring in promoters of their brand that share content that both in the room and remote audiences want and can engage with. Frontgate, stepped it up by holding a prize drawing that featured people in the room and anyone who left a comment of the live stream. We also think that our clients gain the most, by having someone on your team interacting with the live audience on Facebook live stream, via comments. You can view the recorded live stream here. It’s a pleasure to introduce you to our Dallas Team Lead, Patrick Dolan! Patrick joined Varvid early in 2008, after working with Aaron Booker (Varvid’s CEO) on the board of directors for an IT industry peer networking group. Being active in the IT industry for for 30 years, and having background in production management, Pat’s skills have established him as a practicing live streaming professional. In 2011, his accomplishments guided him to opening Varvid’s Dallas office. Patrick is courteous, attentive, and honest. His devotion to your event’s success is founded on maintaining an upbeat personality even throughout the most trying times of production. Simply, Pat aims to provide the North Texas area with a professional and fun approach to creating a truly Connected Event! Contact Pat by calling 214.838.6960, or emailing patrick@varvid.com. In 2017 we will be starting a new project, The Varvid Podcast, which explores how live streaming can be used to build and strengthen communities. We’ve posted a teaser episode to our new podcast library (check it out here). 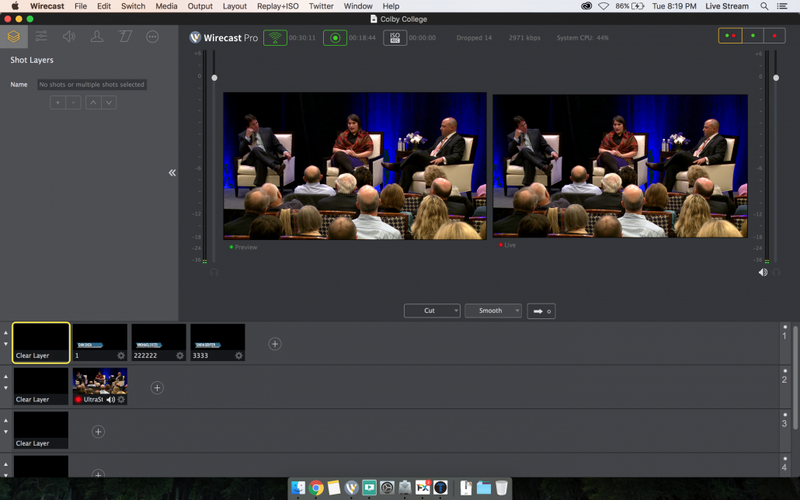 The Varvid Podcast is a resource for everyone interested in live-video production, whether you’re new to live streaming or you’ve been webcasting for years. Host Aaron Booker will pick the brains of individuals who use live video regularly to discover how they use it to connect communities, why live video is important in today’s digital world, and any tips and tools to help improve live broadcasts. As we get started, our guest interviews will be broadcasted live over Facebook, and the edited versions of the episodes will be released bi-weekly on our podcast page. So far our guests include Adobe’s Creative Cloud Evangelist, Paul Trani, the Live Streaming Evangelist at Telestream, Andrew Haley, and Josh Hamm, the Media Director for Life Center Church in Tacoma, WA. Whether you are a live-streaming professional, have an interest in streaming technology, or if you simply just want to learn more about the use of live video, please tune in! Varvid live streamed a portion of Seattle Startup Week 2016 for JPMorgan Chase & Co. branch, and title sponsor of the event, Chase for Business last Wednesday. By using a Roland VR-50HD video switcher and three camera sources, we streamed to Chase’s YouTube channel. Out of the three cameras, two were operated: one focused on the presenters while they took turns speaking, and the other captured the audience’s reaction. The third camera was set in the back of the room capturing a wide shot of the audience and the presenters. Although the entirety of the five-day event wasn’t live streamed, we did get to cover an important panel discussion titled: “Do I really need to invest in Digital Marketing?” The short answer:”Yes!”. Social platform leaders from Twitter, Facebook, LinkedIn, and Yelp held an hour long conversation and Q&A session about the role of social media shaping business identity through digital marketing. SSW is an event led by entrepreneurs for entrepreneurs that aims to develop the Seattle community by building momentum and opportunity for business owners. This year’s event was hosted at Impact Hub in Seattle’s Pioneer Square. If you are interested in creating a startup week in your town or city, learn more here! The political world has no doubt grasped onto the power of livestreaming. Earlier in the 2016 presidential race, for example, Hillary Clinton used Periscope to stream a campaign speech; further, the congressional gun control sit-in streamed over Periscope last June. Similarly, on September 26th, the Trump v. Clinton debate went live on various platforms and included real-time fact checking. Beyond these mainstream broadcasts, political practitioners, educators, and observers have been streaming discussions about the current presidential race. Nevin Zais, Varvid’s Boston Team Lead, operated a Connected Event for The Boston Election Panel discussion. 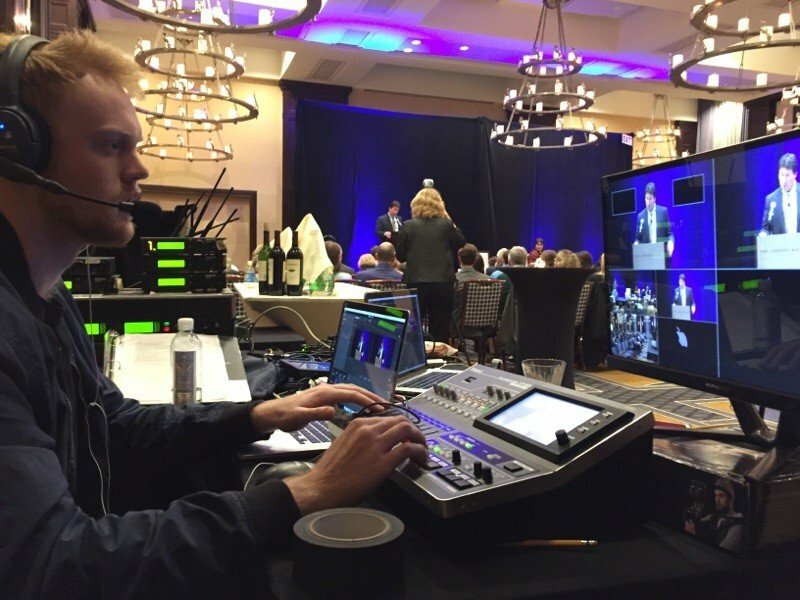 Nevin’s task was to execute a smooth livestream (and recording) by live switching between presenters and making the event look outstanding to remote viewers. “We’re using three Sony EX1’s, a Roland VR-50HD video switcher, and a Blackmagic 4K recorder,” he said. 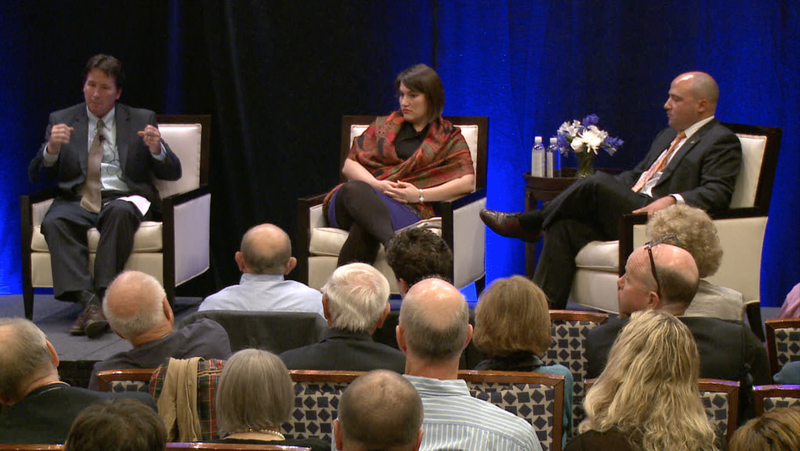 By supporting The Colby Club of Boston and the Goldfarb Center for Public Affairs and Civic Engagement, the “Pulling Back the Curtain on The 2016 Election” discussion was accessible to the public on September 27th. This panel dissected the strategies behind endorsements, campaign finance, and voter behavior throughout 2016. Certainly, this year’s election has a one-word description: unconventional. This panel discussion was presented by the Alumni of Colby College. To learn more about Colby College events, you can find a calendar here.